P/Q. This week’s gene of the week is an atypical epilepsy gene, which is the main reason that this post is only coming out on Friday rather than Monday. Even though I was initially highly motivated to put something together on CACNA1A, I soon discovered that this gene is overwhelming. CACNA1A is a gene for both a channelopathy and trinucleotide repeat disorder, a gene for early childhood-onset and late onset adult neurological disorders, and a gene responsible for both episodic neurological conditions and neurodegenerative diseases. I have tried to put this into a coherent format. Here is what you need to know about CACNA1A in 2015. Some of the variants in CACNA1A mentioned in the current blog post. The CACNA1A story. CACNA1A codes for a neuronal ion channel, the alpha-1a subunit of a voltage-dependent P/Q calcium channel, which is expressed widely throughout the CNS. Until two years ago, you were probably completely safe ignoring CACNA1A in the context of epilepsy and omitting CACNA1A from a potential list of epilepsy genes. CACNA1A is mainly a gene for familial ataxias and hemiplegic migraines with little connection to epilepsy. However, there are some lines of evidence suggesting that some patients with CACNA1A mutations may have epilepsy and no other neurological features. For example, the Epi4K study pulled out a patient with Lennox-Gastaut-Syndrome and a de novo p.A713T mutation in CACNA1A, which was predicted to be damaging. A recent study by Damaj and collaborators in the European Journal of Human Genetics has found mutations and deletions in CACNA1A in patients with epileptic encephalopathies, refractory absence epilepsy, and even febrile seizures. This puts CACNA1A right in the middle of phenotypes commonly assumed to be genetic epilepsies. But let’s review the classical phenotypes associated with CACNA1A first. Summary. In brief, CACNA1A is usually associated with three main familial phenotypes, which can sometimes overlap. These three main phenotypes are familial episodic ataxias, familial spinocerebellar ataxias, and familial hemiplegic migraines. The reason why I am distinguishing episodic and spinocerebellar ataxias is due to the fact that the disease presentation in these conditions is entirely different. Episodic ataxias lead to brief, recurrent, non-progressive episodes of lack of balance, whereas spinocerebellar ataxias are chronic, progressive diseases that are often associated with imaging findings (cerebellar atrophy). Historically, CACNA1A was identified in familial hemiplegic migraine and episodic ataxia at the same time in 1996. The discovery in spinocerebellar ataxia followed soon afterwards in 1997. Here are the various CACNA1A-related phenotypes. Familial hemiplegic migraine 1 (FHM1). Familial hemiplegic migraine was one of the first phenotypes to be associated with mutations in CACNA1A. FHM is characterized by migraines with aura that is associated with weakness on one side of the body. Patients with FHM due CACNA1A mutations can have loss of consciousness or even coma in association with mild head trauma. In some families, the FHM phenotype may overlap with other CACNA1A-related phenotypes. Episodic ataxia 2 (EA2). Episodic ataxia type is characterized by attacks of gait ataxia, poor balance, nausea, vomiting, and sometimes particular eye movement disorders that is referred to as oscillopsia. Patient with episodic ataxia can present in childhood or adolescence and the attacks can last between hours and a few days. Sometimes, attacks are set off by triggers such as physical physical stress, infection, fever, heat, exertion, caffeine, or alcohol. The attacks can be associated with various neurological symptoms, occasionally even with the hemiplegic symptoms seen in FHM. Between the attacks, patients usually do not have symptoms. However, more recent studies suggest that up to 50% of patients may eventually develop chronic neurological features such as nystagmus or cerebellar atrophy. Spinocerebellar ataxia 6 (SCA6). Spinocerebellar ataxia is a slowly progressive neurological disorder that is characterized by progressive limb and gait cerebellar ataxia. Often, patients also develop other neurological symptoms such as dysmetria in the upper extremities, intention tremor, dysarthria, and various oculomotor symptoms such as nystagmus or diplopia. The bulbar signs especially dysarthria can be the presenting sign in up to 10% of patients. Patients usually present with symptoms in adulthood, usually in their 40s and 50s. The epilepsies. The reason why I am referring “the epilepsies” as a CACNA1A-related phenotype is our current difficulty in fully understanding the entire spectrum of seizure disorders caused by mutation in CACNA1A. Absence seizures appear to be a relatively common feature, found in up to 10% of patients in EA2 families. Generalized EEG features are a common finding. However, despite the known association with epilepsy, some earlier reports need to be viewed with caution. For example, OMIM implies a definite involvement in Idiopathic/Genetic Generalized Epilepsy (IGE/GGE) based on an older association study that has not been validated in more recent studies. As mentioned below (“Genotype: three criteria”), CACNA1A can be a deceiving gene, and rare population variants in this gene can be found that may be initially interpreted as causative. Also, we suggested in a previous blog post that a study suggesting variants in CACNA1A as modifiers in Dravet Syndrome should be interpreted critically. Intellectual disability, autism. The publication by Damaj and collaborators also identifies individual patients with ADHD, intellectual disability and autism carrying CACNA1A mutations. However, other CACNA1A phenotypes were also present in most patients. Sometimes, the other neurological manifestations of CACNA1A may be less prominent and the presenting feature for patients may intellectual disability or autism. Genotype vs. phenotype. There is some degree of genotype-phenotype correlation in CACNA1A, even though the correlation between subphenotypes and variability within families is large. There can be incomplete penetrance, and especially in FHM families, up to one third of patients can be unaffected. FHM has been associated with missense alterations in CACNA1A that code for functional regions of the protein, typically either the pore lining or voltage sensor region. Most EA2-associated CACNA1A alterations result in premature protein truncation, but missense alterations have also been reported. For some EA2-related missense mutations, functional studies have demonstrated that lead to loss of P/Q channel function. SCA6 is associated with CAG repeat expansions in CACNA1A. Eighteen or fewer CAG repeats is considered non-pathogenic, and 20 to 33 CAG repeats are considered pathogenic, and patients usually become symptomatic with spinocerebellar ataxia at some point in their lifetimes. However, there is some variability in siblings carrying the same amount of CAG repeats. My patient has a mutation in CACNA1A – what does this mean? 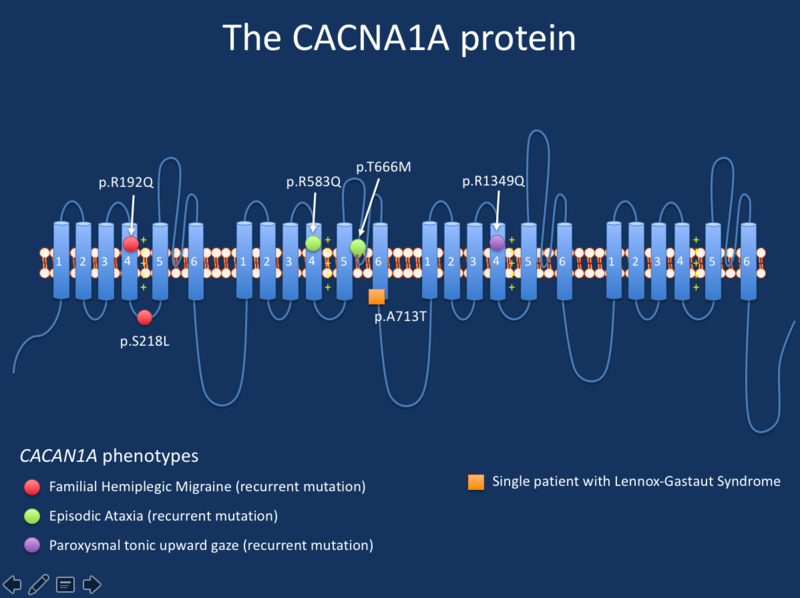 Assessing CACNA1A variants is difficult in many cases. This gene is included in many gene panels and clinicians may be faced with the problem to interpret milder symptoms in transmitting carriers correctly. For example, when looking at the segregation of CACNA1A variants, does the presence of migraine without aura in a parent of child with absence epilepsy suggest that the variant is causative? CACNA1A is a large gene and with the advent of widespread genetic testing, both causative and rare population variants in this gene are identified. Here are three criteria that may help you interpret CACNA1A mutations in your patient. 1 – Variant. There is some emerging data on recurrent variants for some of the CACNA1A-related phenotypes, such as the familial hemiplegic migraines. Therefore, the p.R192Q or the p.S218L variant have been reported in multiple families with FHM, the p.R583Q or p.T666M variant has been found in several families with FHM and ataxia. CAG repeat expansions larger than 20 repeats are associated with SCA6. The p.R1349Q variant has been found recurrently in patients with ataxia, intellectual disability and paroxysmal tonic upward gaze. Episodic ataxia and epilepsy phenotypes are often associated with truncating mutations or deletions. Therefore, either known recurrent variants or truncation mutations/deletions may be considered explanatory for the patient’s phenotype in the absence of segregation data or the precise phenotype. 3 – Phenotype. The phenotypic spectrum of CACNA1A is large and the question may arise, which phenotype would be considered incompatible with CACNA1A as the underlying gene, suggesting that an identified variant may be considered non-causal based on the phenotype alone. Based on the currently available data on the epilepsy phenotype, most epilepsies have a generalized component. The spectrum of the phenotypes is broad and expanding, and future studies will help us figure out the associated epilepsies better. This entry was posted in CACNA1A and tagged CACNA1A. Bookmark the permalink. Ingo, thank you for the timely, informative, clear update.